Three Young Liberitarians pose in front of their constitutional rights posters. 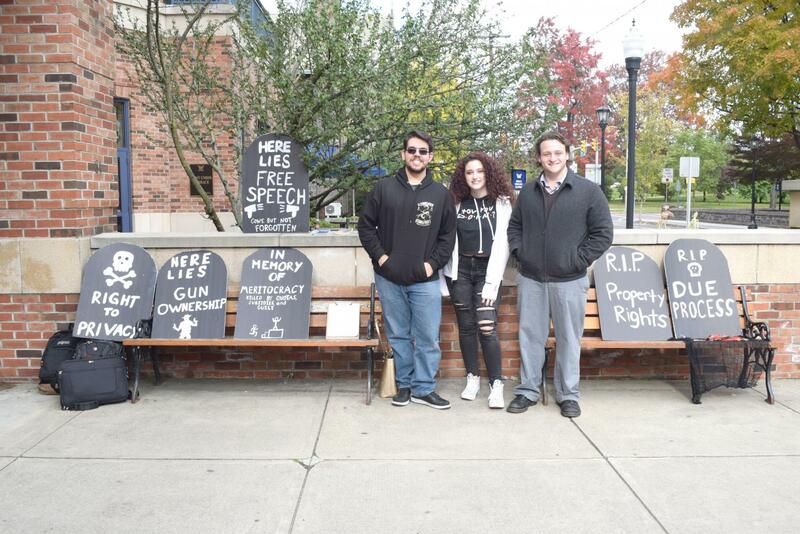 On Oct. 25, the local chapter of the Young Americans for Liberty held a demonstration during club hours in front of the Henry Student Center. The Young Americans for Liberty is a nationwide organization that has more than 760 different chapters all over the United States. The local chapter is headed by four Wilkes University students who want to inform the campus of their views and their presence. Garrett Gagliardi, a junior accounting major, was one of the frontmen of the chapter and explained what they planned to bring awareness to. “We are trying to bring attention to that fact that our politicians, our elites, they kind of don’t really care about these rights anymore,” said Gaglardi. 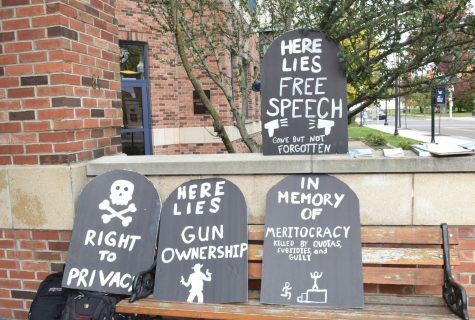 The students stood in front of six different gravestones marked with the different constitutional amendments that pertain to individual rights. Gaglardi explained that they are libertarians meaning they are not party affiliated. “We are basically for individual liberty and limited government in all spheres of life,” explained Gaglardi. Brian Voorhees, sophomore mechanical engineering major, attended the demonstration as the Outreach Director for the chapter. He further explained his role in the local chapter and how he got involved. 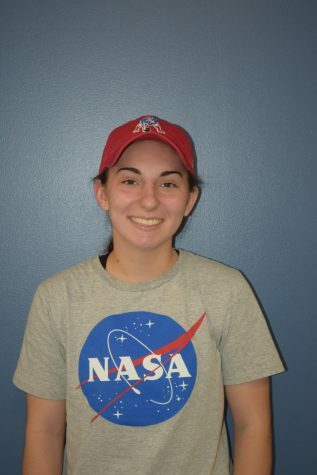 “I just stumbled upon this … I was really interested in getting the word out about this because I have big dreams for things like social media,” said Voorhees. He explained the different events they’ve held in the past to help inform Wilkes students of their rights. They held a table in the Henry Student Center testing students on their basic constitutional rights. They then gave people their score backs in hope to further teach them of their most basic rights granted by the Constitution. However, because they are a relatively new organization, without Student Government recognition, they haven’t had as many opportunities to hold a lot of events, but they are hoping to have more events in the future. “We are just getting started, but there definitely is more to come,” added Voorhees. Gaglardi added to Voorhees’ statement about their future by giving a more detailed look at their potential future. Cienna Tohme, a sophomore MDMA, got involved with the chapter through Gagliardi, a friend from her high school. The posters mock the laws that have “killed“ our different constitutional rights. The chapter is looking to gain Student Government recognition within the next few weeks to expand its views across campus. 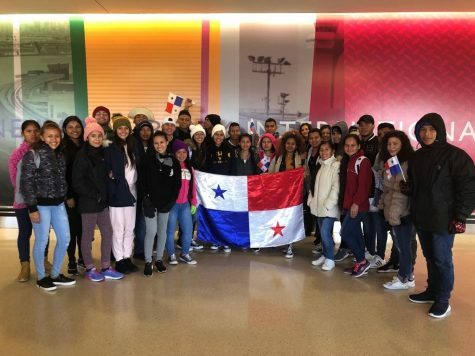 The group hopes, with this recognition, to become further involved with the community as well as to host fun and educational events for students. The chapter meets every Thursday at 11 a.m. to discuss and inform those who are interested in their beliefs. Although they are a Libertarian organization they do accept and welcome those who are party affiliated, whether democratic and republican.